Spring Academy classes ran for eight weeks from April 1 to May 25. Classes included two new offerings: Explorations in Literature and Chemistry Lab. Some Academy classics were also held: Organic Chemistry, Primary Advanced Math, Neuro-Energy I and II, Molecular Biology, and Astronomy. Our student attendance was the fullest it’s been and included ten new students from local public and private schools. Chemistry Lab, taught by Dr. Rosemary Rohde and Ronnie Bryan, was a hit with its hands-on curriculum. Dr. Rose took concepts from Chemistry I and II and expanded on them by conducting correlating experiments for each of the eight weeks. Some lab topics were rates of reaction, electrochemistry and chemical equilibrium. Proper safety precautions were taught with the use of chemicals—information most students don’t usually cover until they take a high school chemistry course. 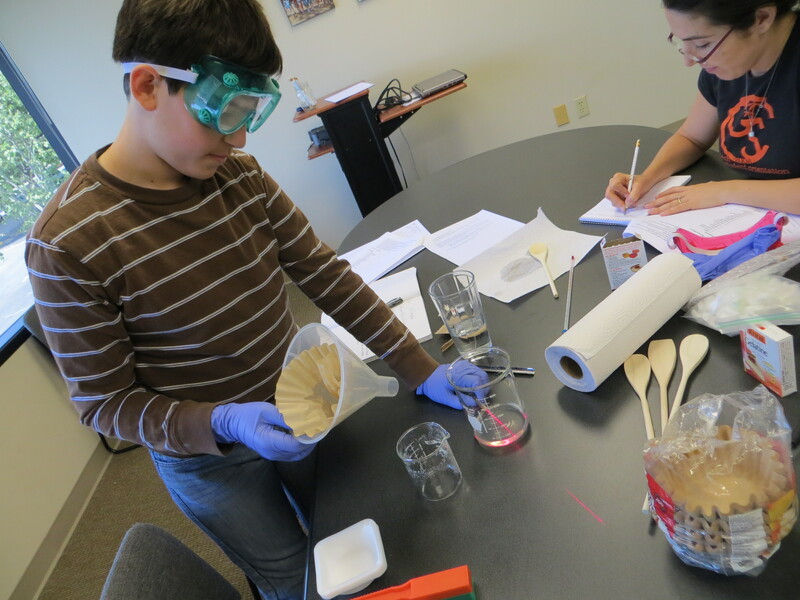 The new Chemistry Lab class with tons of hands-on experiments was a big hit! Take a look at more Spring Academy highlights! Podcasts are an excellent source of entertainment and challenge; they keep us alert on the commute home, amused while waiting at the doctor’s office and entertained before falling asleep. At IEA, we are discovering that podcasts can also be an excellent alternative source of information for our brightest minds. Plus, we know that your kids, who constantly crave information, are going to be looking for cool things to learn about over the holiday break from school. As our gift to you this holiday season, we present our five favorite podcasts for the gifted child. See our 5 picks here! Jen Mounday is the Program Coordinator for IEA’s Academy program. Academy provides young gifted students with challenging enrichment classes that focus on exploration and the application of knowledge. 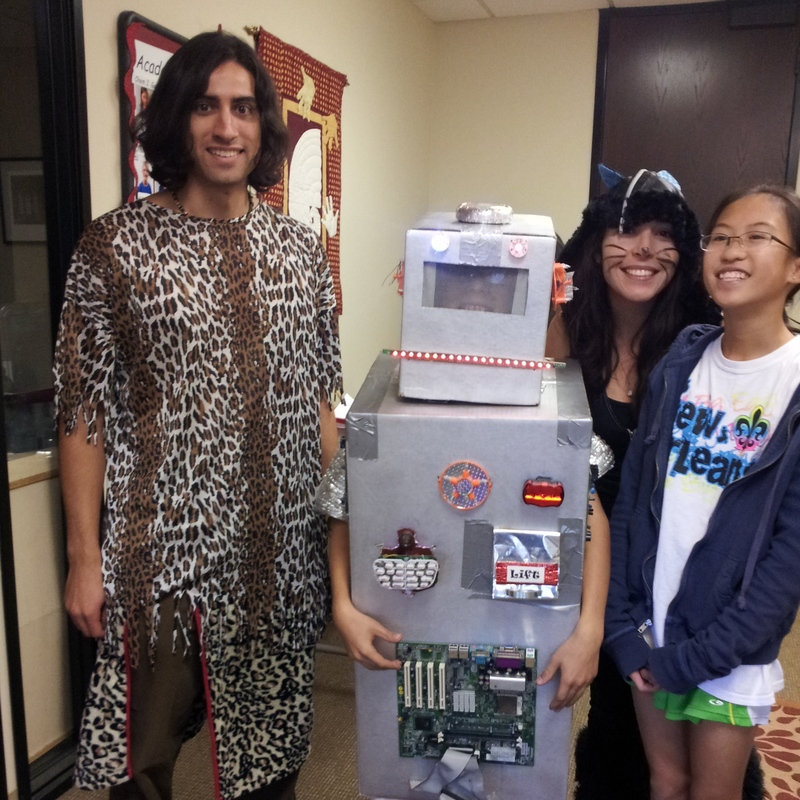 Academy students and instructors dressed up for Halloween – Nico made his own robot costume! I was a classroom teacher before coming to IEA to be a Program Coordinator. From my years teaching, I naturally developed a mental catalogue of gifted students and the impressions they made on me over time. My experience in the classroom left me well acquainted with the gifted child: the voracious reader, the classical music lover, the Spanish speaking whiz, the student who challenges, the one who ponders—the child who has the uncanny power to shape you through their own quest for answers and truth. The memories I have working alongside gifted and talented kids are ever in my mind’s eye as I coordinate enrichment programs for this demographic. IEA’s Academy welcomes kindergarten through eighth grade students into classrooms of like-minded peers. As much as I grouped students homogeneously when I was a classroom teacher, I have realized that there is nothing like an Academy classroom. Observe and you will see astronomy PhDs teaching astrophysics to a group of eleven-year-olds; the students are engaged, asking questions and driving the lesson deeper. It’s the power of the Academy classroom that is meeting a need in our community—drawing highly able students beyond the mainstream classroom framework and up a bit higher. The 2012 fall quarter for Academy included multiple levels of chemistry and neuro-energy. Students worked with molecular model kits to identify molecular make up. In Neuro-Energy II: Intro to Computer Programming, students learned the basics of Java Script to build a website. I watched in one class as a second grader stood transfixed, looking at the projector screen as the instructor demonstrated how to create digital clocks using code. The student was grinning, captivated, bouncing up and down on his heels, like he’d just seen Santa. Our classes are unique, much like the students and the instructors themselves. Sometimes the novelty of the program is all it takes to get students excited about the classes. In Academy, there are no limits. Instructors, specialists in their field, encourage as many questions as can be asked and are willing to go off on a tangent or two to satisfy interest. Our students can come, just as they are, to talk literature, chemistry, robotics, or math and be heard, embraced, and understood. And naturally, by the end of each quarter, Academy students build relationships through a process of discovery. Over the course of grappling with content that is typically off limits to their peer group, they become a community. We do our best to extend this community beyond the classes as well. Last week, we held Academy Family Night here at the IEA office. It was an evening for the families to get to know each other and parents to hear from our president, Elizabeth Jones, on the social and emotional needs of gifted youth. It was an evening of learning and togetherness. Parents shared their experiences of raising gifted children, found support in each other and offered their gratitude for our programs. We will continue to hold parent nights each month through May. We know that enrichment programs like Academy are often the bright spark in the gifted child’s week. We at the Institute for Educational Advancement are happy to provide that spark for our local community and beyond. The Winter Session of Academy will run from January 12 to March 7. The schedule and applications are available on the Academy page of our website. Enroll your child today! What enrichment programs have you found to inspire your son or daughter? Please share with us in the comment section below. Radiating Possibility is an inspirational video highlighting the insight of Benjamin Zander, conductor of the Boston Philharmonic. In partnership with his wife, Rosamund Zander – an executive coach and family systems therapist – he created five key steps to radiating possibility. The short film gives viewers the opportunity to witness Ben in action as he conducts his orchestra and individually tutor musicians in a very unique way. He draws his students out of the competitive mindset of performance and, instead, pushes them to experience life in their talent and a real connection to their skill. His dynamic instruction, combined with Roz’s therapeutic intuition, opens up a vibrant world of possibility that lies beyond fears, habits and assumptions. Viewers discover that every human being brought into the world of radiating possibility will be encouraged to keep their song going. For the gifted child, Radiating Possibilty is the perfect conduit for self-discovery in a world often times wrought with competition and pressure. At Yunasa, we presented Radiating Possibility on the first night of camp and used it as a touchstone each day for accelerating the pace of interaction among peers. The goal was to give campers the courage to open their hearts and enter the dance, to drop the assumption that people aren’t interested in what they have to say. After a rousing clip of Ben conducting his orchestra with so much gusto that the musicians around him grin from ear to ear, he exclaims, “Throw yourself into life like a pebble in a pond and notice the ripples!” Gifted children may feel pressure from themselves or their peers to minimize their focus in a particular field because it is “too much” or “too intense.” They often receive verbal and nonverbal cues from the community around them suggesting they hold back or “rein in” their passion, enthusiasm or contributions in order to fit in with the group. But when gifted students are inspired to participate, with whatever skill sets they bring to the table, they are given an outlet and a means of giving back to their community, their peers and their families. Many gifted children struggle with perfectionism. Gifted children are well above average in certain areas, but they are still bound to make mistakes as part of being human. When gifted children practice looking in the face of failure; raising their hands, their voices and their eyebrows and shout, “How fascinating!”, they learn not to waste time dwelling on mistakes and to use mistakes as learning opportunities. When Ben is instructing a student, he says he is “dealing with the student and the person standing next to the student” who whispers statements of doubt and fear in the student’s ear. We can’t necessarily get rid of the voice in the head, but we can choose how we respond to it. Ben suggests we say, “Thank you for sharing, but I’m busy,” to that negative voice. When gifted children focus themselves on being a contribution, they are able to achieve great things. Giving credit to the voice in the head only conceals their special talents. The gifted community can benefit greatly from self-talk as a means to overcoming these negative voices so they are free to perform, showcase and contribute in a way that holds nothing back! Live in radiating possibility. Become part of the song! The realm of possibility is all about dreams. In the dream world there are no barriers. The gifted mind is naturally full of possibilities and creative dreams. Allowing oneself to radiate in those possibilities takes practice. Practice begins with acting as if no barriers exist. Ask yourself, “How will I contribute today?” In the classroom, in group settings, in peer relationships, gifted children should see what they have to offer as a contribution, not just evidence of individual talent. Whether it’s playing an instrument, competing for a title or even earning grades, each act of will viewed as a contribution builds on the feeling of being fully alive. When gifted children think of themselves as contributing to something bigger than them, rather than measured as an individual success or failure, they strengthen their emotional and social muscles and discover a renewed sense of energy. Gifted people radiating possibility become powerful forces in our society for good. Let us be the parents, teachers, family and organizations that help silence the voice in the head and become part of the song! Have you or your kids tried any of these steps? How did they work out? Please share with us in the comment section below! IEA’s pioneering Yunasa and Yunasa West summer camps unite highly able youngsters and experts in the social and emotional development of gifted children. 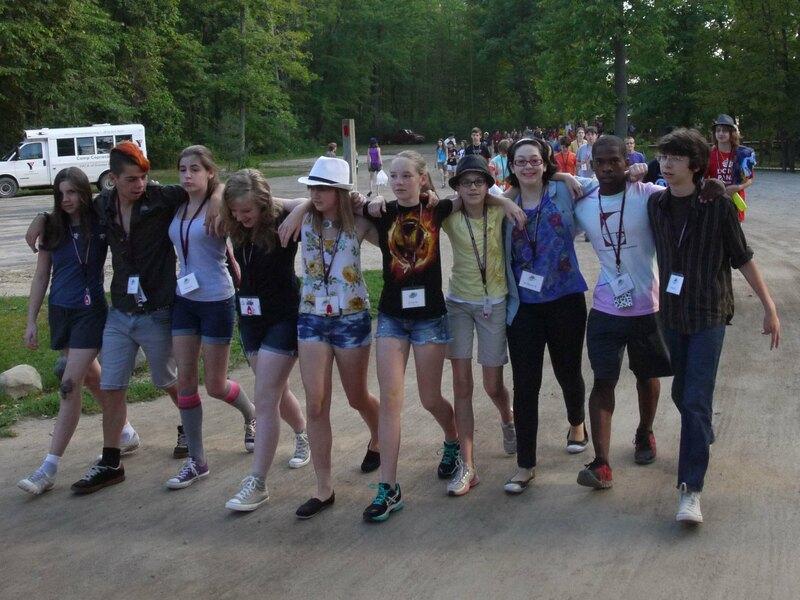 Campers explore and grow the intellectual, spiritual, emotional, social, and physical aspects of their lives. 2012 saw another memorable year of Yunasa in Flint, Michigan. Campers arrived on Sunday, July 22, at Camp Copneconic with great anticipation for the week to come and left mid-morning on July 29 elated from a week of flourishing at camp. Yunasa is more than your average summer camp—it’s a week-long exploration of one’s intellectual, spiritual, emotional, social, and physical self. The week was a success on all levels, as campers took away valuable life lessons, deeper bonds with peers, and unforgettable memories. 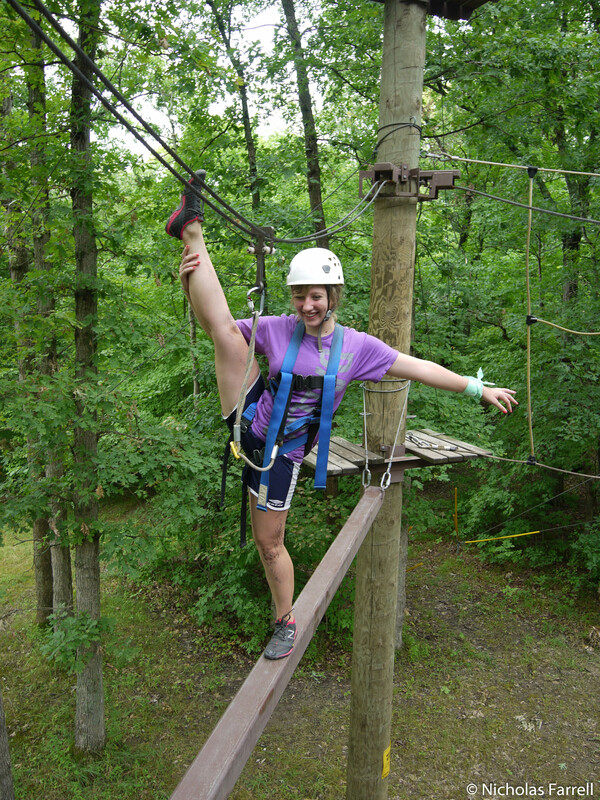 A high ropes course, offered as one of the many camper options, tested campers’ physical and risk taking abilities. Psychosynthesis sessions were led by our Fellows, experts in the growth and development of gifted youth, each morning. Campers practiced guided visualization and relaxation techniques. Many campers said that Psychosynthesis was their favorite part of the day. The Emerging Leaders (ELs) hosted a camp-wide talent show, including a comedy routine, musical performances, and a choreographed dance. 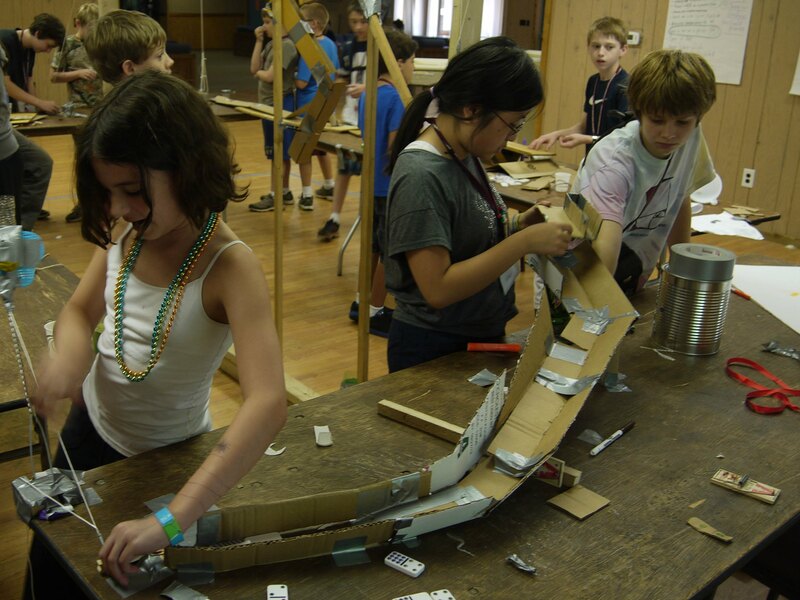 One camp session was an ongoing Rube Goldberg project, where campers used various materials to construct a complex machine that, in the end, would perform a simple task. After much deliberation, campers opted to make a device that would put a hat on someone’s head. The Counselors in Training (CITs) put on the annual Yunasa Olympics. Physically and mentally challenging, the events included in the Olympics vary from year to year. 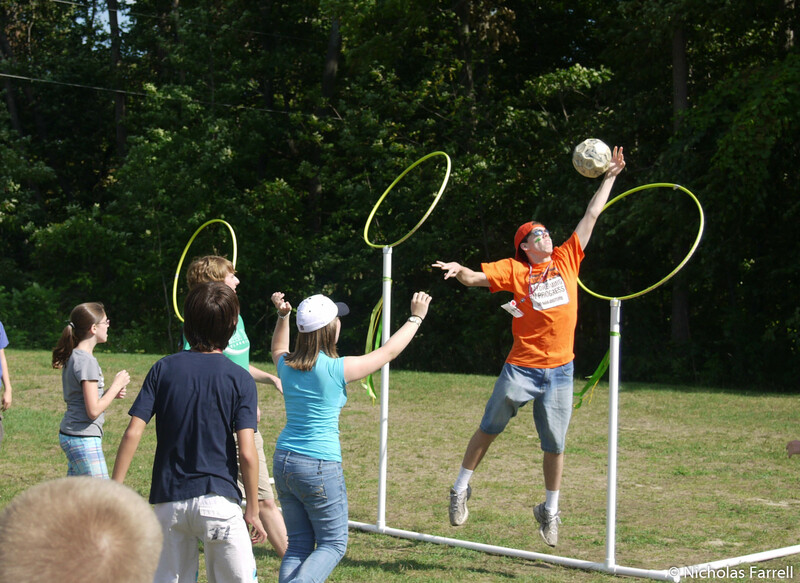 A game of Quidditch was the highlight this year! 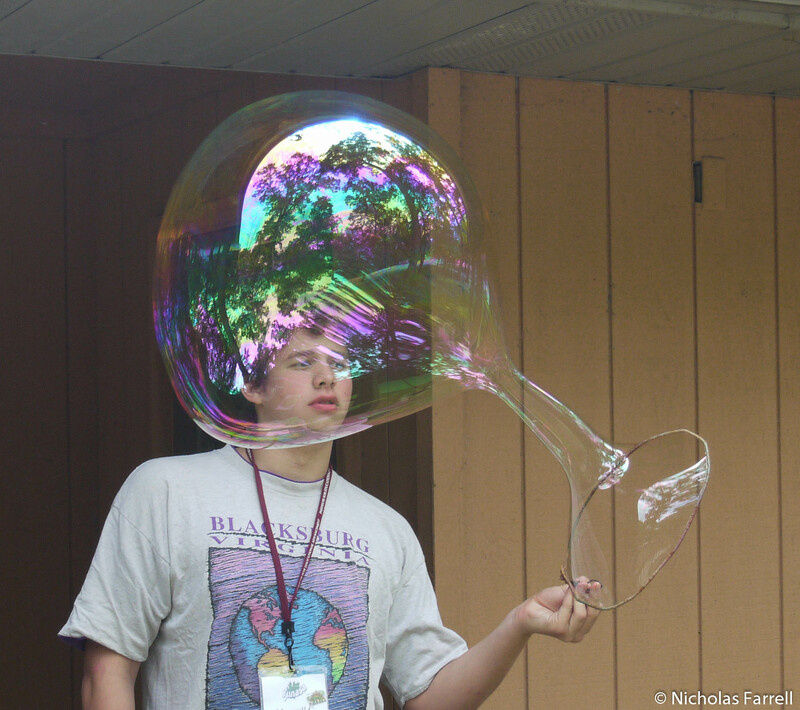 Bubble making stations were set up outside the conference center and available throughout the entire week. Campers enjoyed the option during down-time in the midst of an eventful camp schedule. During the week, campers become a part of the Yunasa family. Many campers describe Yunasa as a time of true friendship and togetherness. Throughout the week, campers were encouraged by staff and their peers. 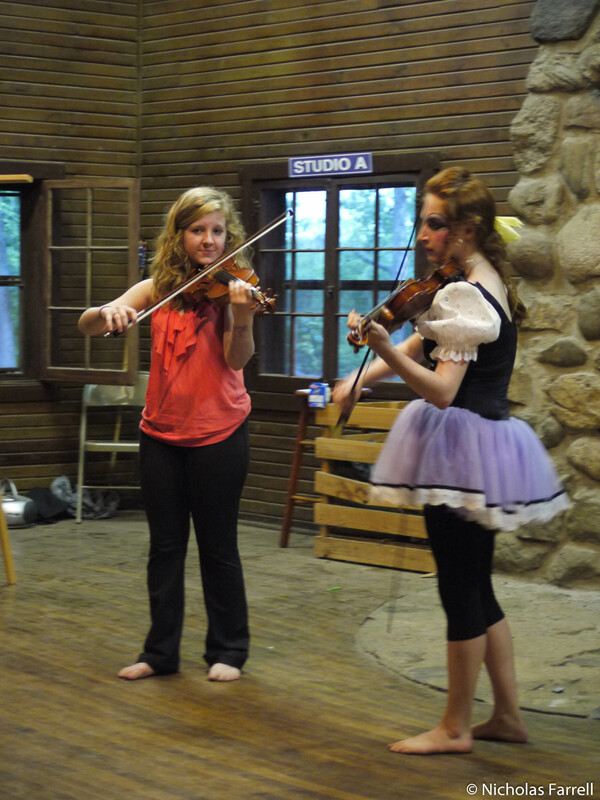 Many campers felt “at home” and inspired to be their authentic selves. There were multiple unique opportunities for personal growth. With physical activities such as horseback riding, water sports, zip lining, and ropes courses, campers were challenged to develop confidence in their athletic abilities. With the support of the Fellows and IEA staff, they also grew emotionally with one another and in self-awareness. Campers called on their spiritual abilities to connect with the world around them through activities such as Spirit Journey and Call in the Directions. 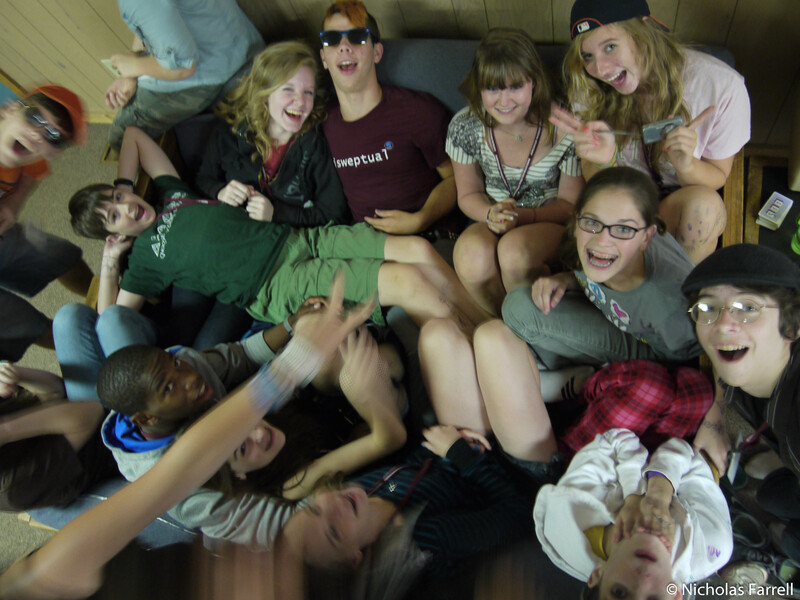 Intellectually, campers enjoyed sharing with one another in an environment of acceptance and mutual understanding. Our hope is for these campers to return home with cherished Yunasa memories to share and hold onto until we meet again next year. Thank you to Nicholas Farrell for taking these photos at camp! For more photos from Yunasa, click on the button below. Also, be sure to check out the article about Yunasa in The Flint Journal! What was your child’s favorite part of Yunasa this year? Please share with us in the comment section below.